Studies of earthquake triggering near fluid injection sites show that very small stresses from the passing surface waves of distant earthquakes can cause small earthquakes to nucleate, suggesting that the crust near injection sites is critically stressed. While we know from such observations that very small increases in stress can produce earthquakes, it is much less clear what stresses, either from tectonic forces or injected fluids, can produce earthquakes of a particular size. The goal of this project is to use injection-related data, detailed geological information, seismic waveform observations, and poroelastic modeling near injection sites to constrain a magnitude predictable relationship between input stresses and earthquake size. In addition, it aims to determine what physical features (if any) distinguish induced earthquakes from their tectonic counterparts, and to identify the factors which make some sites more susceptible to induced seismicity than others. Tremor is a term for a seismic phenomena that was, until recently, associated with a volcanic source. Volcanic tremor differs from earthquakes in its long, harmonic waveforms and its occurrence in proximity to volcanoes. In addition to distinct waveforms, volcanic tremor is sustained for minutes to hours, well-beyond local earthquake durations. In recent years, non-volcanic tremor (or simply tremor) has also been observed on several continental faults, such as the San Andreas fault along with related events termed very low frequency earthquakes (VLFEs). 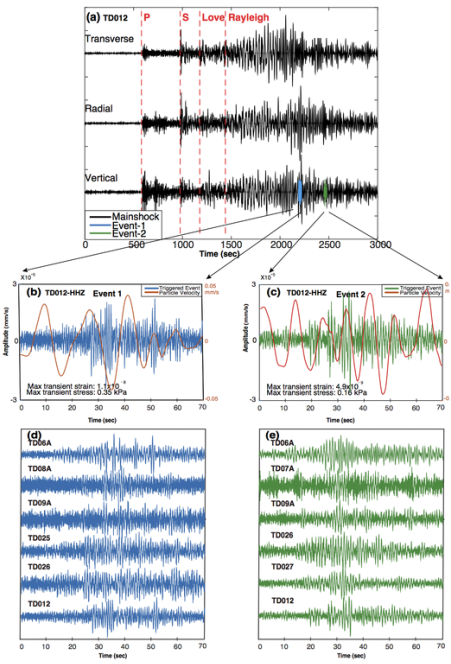 Similar to volcanic tremor, tremor events on faults can have durations ranging from minutes to hours, but more recent observations suggests that the long-duration signal may be comprised of a series of individual burst-like events that are similar to earthquakes but with lower amplitude. VLFEs comprise signals that contain energy mainly within the 20 - 50 sec period band. The primary project aim is to learn more about the individual burst-like events comprising tremor episodes and how they relate to VLFEs and regular "garden variety" earthquakes. 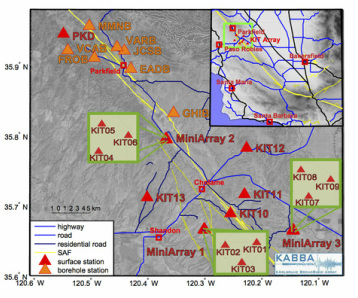 Read about recent work we've done looking at earthquakes near the transition zone on the San Andreas Fault near Cholame, California here: http://www.seismosoc.org/news/ssa-press-releases/bssa-mapping-lfes-along-the-san-andreas-fault/. Low-frequency volcanic earthquake waveforms differ from their tectonic counterparts in their higher proportion of low-frequency energy, and their often protracted durations relative to earthquake size. Their rupture dynamics are poorly understood. One reason for our poor understanding is the difficulty in distinguishing the influence of the earthquake source from the effects of propagation through the highly attenuating volcanic edifice on the path from earthquake to seismometer. I am trying to understand if volcanic seismic events rupture in the same way that their tectonic counterparts do. In addition, I am trying to determine whether the immature faulting environment in the volcanic edifice influences how they rupture. Photo taken by the U. S. Geological Survey, Cascades Volcano Observatory, and is available on their website. Earthquake source parameter studies are often done in the context of a geological region (e.g., subduction zone, vs. continental fault environment), rather than on the physical features of the faults on which the earthquakes occur (e.g., rock type, or fault surface roughness). Local physical fault features are arguably the most important factor that may influence how an earthquake ruptures. Even so, they are rarely considered on a in earthquake source studies, and may potentially explain much of the variation in earthquake scaling. I am trying to better understand how the physical features of a fault affect how earthquakes rupture by linking geological observations to seismic observations on a local scale in fluid injection environments in western Canada, and in an intraplate environment in eastern Canada (Quebec).